Street teams have been a crucial component of radio stations’ marketing strategies for decades. On the programming side, we frequently deploy them to engage with listeners at concerts and festivals. On the sales side, promotional appearances are often an important part of closing deals companies like car dealerships and beer distributors. 1. Download the station’s mobile app. “Wanna play our game? Download the WKRP mobile app and then show me your phone.” This doesn’t require a lot of explanation, making it a great call to action in loud, crowded environments like concerts. Plus, every time people look at their phones, they’ll be reminded of your station. Sure, some percentage of them might uninstall your station’s app later, but not all of them, so you’ll move the needle over time. 2. Sign up for the station’s email list. The worst way to collect email addresses is to have people write them down by hand. The best way is to have people type them directly into your email database program. To do this, you’ll want a tablet, such as an iPad, and a hard case that allows you to lock that tablet down to prevent it from getting stolen. Many email service providers have a tablet app that serves as a dedicated registration form for on-site appearances. For example, Mailchimp, which we use here at Jacobs Media, has an app called “Mailchimp Subscribe.” Set your locked iPad out on a table and require people to sign up before playing a game. 3. Text in a keyword. When people respond with an email address, it will automatically be sent to your email marketing platform. Once people join your email list by text, don’t send them any more messages to avoid violating spam laws. Although they’ve been around for a while, StarStar Mobile phone numbers haven’t yet penetrated the mainstream. They work in a manner that’s similar to a text message keyword, except they’re easier because they use your phone as a phone. For example, somebody might dial **WKRP. This will connect them to a customized voicemail greeting where they can use voice commands, and will also send them an SMS message with links to various destinations that you set. 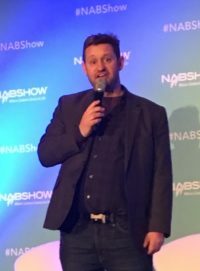 At the moment, only a handful of radio stations are beginning to experiment with this technology, but it offers a lot of potential for broadcasters. By employing clear, concise calls to action at on-site promotions, your street team can offer a big boost to the station’s digital strategy. Gather your team and figure out which of these calls to action make the most sense under different circumstances.